(Bloomberg) -- Wherever you look in Europe’s financial markets, the signposts are pointing to the same thing: a pronounced slowdown in the region’s economy before the European Central Bank has even started to normalize interest rates since the last one. While policy makers seem to hope that the dip might be a brief one, traders are sending out a starker message. 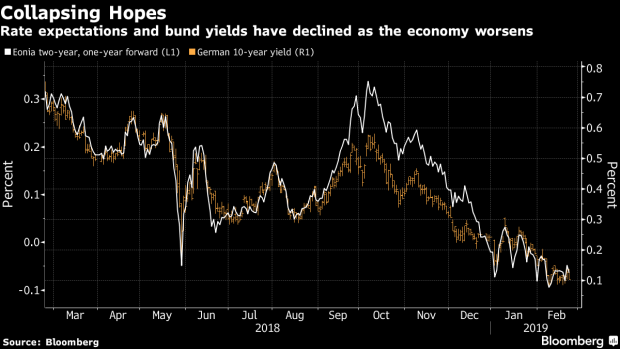 Traditional metrics -- the euro and bund yields -- are hovering near multi-year lows, while inflation is expected to barely get off the ground over the course of the next 10 years, putting serious doubt on whether the ECB can hike rates anytime soon. Axa Investment Managers, which oversees 759 billion euros ($860 billion), has a long position in 30-year bunds, benefiting from economic pessimism. For Citigroup Inc. too, flagging inflation means the bund rally may have room to extend while for Societe Generale SA, the euro is still overvalued on a trade-weighted basis, despite it being one of the worst performers this year. Potential fracture points for the region’s economy abound. Its third-biggest economy, Italy, slipped into recession in the second half of last year while its powerhouse Germany only just avoided it. Political stumbling blocks also litter the landscape, with the contraction in Italy putting more pressure on its fledgling government and its investment-grade credit rating, and European Parliamentary elections could herald a populist wave in May. Inflation may be tepid now, clocking in at just 1.4 percent in the year through January, but the outlook may be even more concerning for the ECB. A gauge based on derivative prices shows the five-year inflation rate will be just 1.45 percent five years from now, well below the ECB’s target of less than, but close to, 2 percent. That will likely keep bunds near their recent highs, according to Citigroup analysts led by Jamie Searle. There is no sign of the reflation that spawned a 90-basis-point “tantrum” in the securities in 2015. In short, interest-rate expectations have collapsed over the last six months. Traders are not pricing the first ECB rate hike since 2011 until June next year, while many in the market are betting that the institution won’t be able to raise rates at all before the next recession. Some are even seeing a so-called “Japanification” of the region, meaning rates could stay negative well into the future. Indeed, money markets are pricing in around 20 basis points of hikes over the next three years. Europe’s shared currency arguably should have appreciated against the dollar given that the Federal Reserve has signaled a halt in rate increases, while the ECB starts off from a much lower level. Instead, the euro is holding near the lowest level in 18 months. One-year euro-dollar risk reversals, an option market gauge of sentiment, are also still bearish for the currency, albeit having picked up from two-year lows. Demand for out-of-the money one-year options on the euro are languishing near the lowest since 2016, suggesting traders aren’t expecting big swings with monetary policies seen on hold for the foreseeable future. --With assistance from Vassilis Karamanis and Tanvir Sandhu.